The lobby is large with white tiled flooring and blue leather sofa's. Take advantage of recreation opportunities such as bicycles to rent, or other amenities including complimentary wireless Internet access and a television in a common area. Additional features at this hotel include discounted use of a nearby fitness facility and a vending machine. Situated in Ostend, the Burlington Hotel provides 3 star rated accommodation. Off site car parking is available. Dining is available at the hotel, which has it's own restaurant. Meeting facilities and wifi are available. Room Facilities Burlington Hotel. All rooms have a hairdryer. There is a no smoking policy throughout the hotel. Rooms have wireless internet access available. Leisure Info. 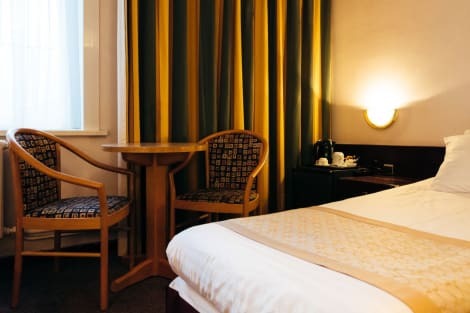 Leisure facilities are available at the Burlington Hotel. Relax in the luxurious hotel sauna. This hotel is only 150 m from the sandy beach in the centre of Oostende. Oostende Railway Station is a 10-minute walk away and De Haan and Bruges are both less than 30 minutes away by car. The Sea Life Centre in Blankenberge is just over 30 minutes' drive from the establishment. Various restaurants, bars, pubs, nightspots and shopping venues are around 200 m from the hotel and the bus and railway stations are approximately 500 m away. This renovated 54-room city hotel features the On The Rock's Bar, which serves beers and cocktails in a casual setting. WLAN Internet access is available. In addition to a lobby area with 24-hour reception and check-out services, hotel safe, currency exchange desk, cloakroom and lift access to the upper floors, further facilities available to guests at this air-conditioned establishment include a restaurant, conference room and a bike hire service. Private garage parking is available for a fee and there is a children's playground. In addition to a private bathroom with a shower, bathtub and hairdryer, in-room amenities include a satellite/cable TV, radio, Internet access and a mini fridge. Further features of accommodation units include an iron and ironing board, double or king-size bed and individually regulated air conditioning and heating. A safety deposit box and a balcony/terrace also come as standard. Guests can use the solarium, sauna and a steam bath for an additional surcharge. The hotel also features an indoor swimming pool with sun loungers and a gym. Fans of the fairway can head to the nearest golf course, which is some 3 km away from the accommodation. A buffet breakfast is served each morning at the hotel. Ostend is home to an increasing 80,000 inhabitants, and is Belgium's biggest and best-known coastal resort. Like any other port, Ostend has seen its share of troubled times through the ages. The Spanish held territory here and used it as a base in their battle to maintain sovereignty over the Dutch during their 80-year war for independence. It has seen some of the biggest bloodbaths in that long period, and very little of the city's original state remains. Belgium's first King, Leopald, set up a British-style resort after taking the throne in 1831. It was his heir, Leopald II, who brought the atmosphere of royalty by building grand houses and monuments. Ostend is now a resort to rival Brighton. There's a wealth of arts and sights to soak up in Ostend. Mu.Zee, museum of modern art, and James Ensor House are a time capsule of commemoration to James Ensorhuis, Ostend's great artist. For a breathtaking piece of war history, visit the Atlantic Wall and its museum, one of the few original parts of the city left following its turbulent war times. And try the Amandine if you have kids, the incredible museum aboard a ship. The Church of Saint Peter and Saint Paul is a monument to the city's fond memory of the first King Albert and his queen, Elisabeth. He is recognised for his defensive stance against the Germans. And for shopping, visit Ostend's city centre for flea markets, cafés and creative shops, where you can buy unique gifts, memorabilia and handcrafted shoes. The centre also has a robust nightlife, but being small, the majority of the night scene is concentrated in the district of Langestraat. Hemingway is a café and dance bar, but for old school soul and funk hip-hop, head down to Lafayette Music Bar. The best cocktails however are rumoured to be at Brazza Cocktail Bar. And for a taste of Ostend's specialist beer, try Twilight, a popular rock café. The main menu is seafood throughout all restaurants, however the cuisines vary from Mexican, Italian, Chinese, Japanese, Greek and French-Belgian. Try Marhaba for some of the best Moroccan cuisine, and Bistrot de la Mer; the reviews for their French menu are incomparable. Wherever you dine, the food is fresh and good. Ostend hotels accommodate everyone and are easily accessible from the city centre. Whether it's a quick break or a relaxing stay, you'll find something to suit you, much like the rest of the city.